I would add that not only are they born with talent, but usually they are born with a burning drive to maximize that talent. There are plenty of supremely talented players who lacked that drive and never lived up to their potential. Rest in peace, Robert. We miss you. I am a big fan of the Bundesliga and this situation truly saddens me. My deepest sympathy for Teresa and the families involved. Alex has hit it right on the head. We often strip celebrities, including footballers, of their humanity as we place them on the pedestal of fame. But yet, thier challenges of living normal lives is far more complicated because of OUR desire and their fame. We must remember they are just like us with emotions, fragility, and personal lives. Life is becoming more and more difficult to every one including to those whose profession is to entertain fellow pilgrims through their superhuman deeds in sports and games. 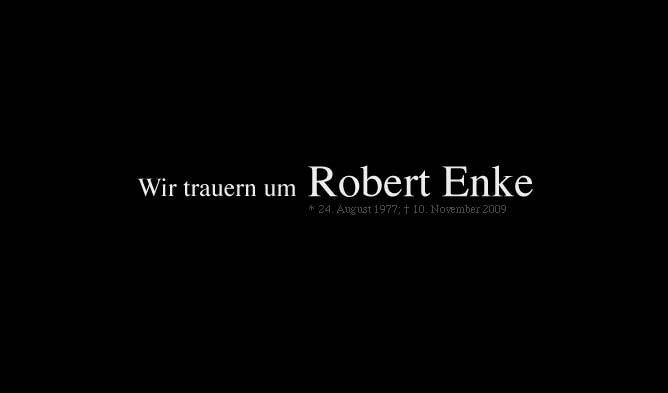 May the Giver of Life grant eternal bliss to goalkeeper Robert Enke. I think in all sport this is something that owners, coaches and trainers need to pay attention to more. One thing that you have to credit Jurgen Klinsmann for back when he was German National Team coach was that he enlisted the services of sports psychologists to monitor the mood of the players. I think this is something you might start to see more of at club teams in the future. But besides that, I am still in udder shock as to what happened. My condolences go out to his wife, adopted daughter, the Hannover 96 squad and the German National Team. Oh,is a pity.may soal rest in peace,amen. Every sportsperson would understand the trauma's and heartbreaks of competitive sports. the German National team yesterday played a friendly game against the Ivory Coast. I have to say that i was extremely impressed of the African team for wearing the same black brass as the German team, in memory of Robert Enke, on there shirts. Thanks for your Respect Africa.